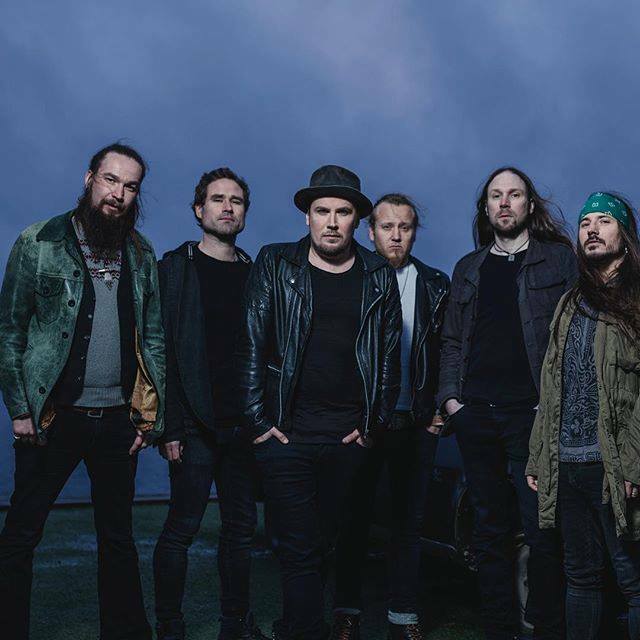 Finnish alternative rockers Uniklubi took the country by storm with their 2004′ breakthrough hit ‘Rakkautta ja piikkilankaa’ (‘Love and Barbed Wire’) and cemented their success with follow-ups and singles like ‘Huomenna’ (‘Tomorrow’). But after Kultakalat album (2010) the five-piece went low-key and only played occasional shows. The band also parted ways with their bassist Teemu and drummer Antti. Many doubted they’d go back to the studio eight years later but here they are, with a new album, Tulennielijä (Fire-eater). We sat down with frontman Jussi Selo before their concert in Tampere’s Kaisla and talked about the hiatus, overcoming the hard times and believing in your dreams. – The new Uniklubi album has a distinguished new sound, new music direction. Was it a conscious change or did it occur naturally? – It was conscious, of course. We had a big break in recording, and it’s not fun to record the same kind of record over and over. We had the same producer working on this record as on the four first albums, Jari Latomaa, but we now have a new bassist, drummer and a new keyboardist, who all brought in something new in a way. If we now compare it now to our first album, Rakkautta ja piikkilankaa, it has certainly changed along the way. My approach to songwriting has also changed along the way. It was very important to start from scratch, release a new disc. It also had big personal significance for us. – Also, in terms of lyrics, Uniklubi now have new topics, new themes on Tulennielijä. Is it explained by the participation of the new band members in the writing process? – Yes, that’s the reason, to a large extent. When several people compose the album, the viewing angle gets wider. All the band members are on one wave, and everyone may contribute to the process. There’s no tyranny like “only I write songs”, for example. Writing songs together makes us stronger as a band. – Besides that, what other changes in Uniklubi’s life and your personal lives had an impact on the new music? After all, it’s been eight years. – Many things had an impact. In terms of motivation… we had those black years. However, we played some shows and rehearsed, so we remained an active band, even though there were some stones on the way. We were close to stopping believing in it but managed to get through. If feels like a new start. – Throughout these eight years many fans had been wondering if you were still alive and if you were about to return. Did you also have doubts at some point? – Of course, we had some doubts. Sometimes we asked ourselves it there was any sense in going on. But then again the band was so important for me, so close to my heart. I didn’t want to give it up. – It was obvious you still had the passion for making music, because you also had a few solo projects during these years. – Yes, the solo projects influenced it too. I wanted to do something different as well. It was a conscious choice and it was crucial for me, because otherwise I would have been suffocating. – How does it feel now that the new Uniklubi album is out? – It feels good, but it also feels like it’s been so long. So this fall we’re already going to record new songs. My vision is full forward. Album Tulennielijä already feels like yesterday. Now our eyes are set onto the future and we’re concentrating on what’s coming next year. – Since you have a baby now, does it mean you’ve got new priorities and there’ll be less Uniklubi shows this year than you used to do? – Now that I have a child, I’m home every day Monday through Thursday, and if there are gigs, they happen over the weekend. So I’m actually home more often than an average working man. – But you wouldn’t leave your child for too long to embark on an extended tour? – Actually, I feel the opposite way. Now that the baby is born, I need to do all even more. I need to be more on the road, more active. Maybe my child’s birth got me to make even more music. – Yeah! It doesn’t mean that I come home and forget about my dreams. Just the other way around. I believe the child motivates me to make better music and maybe to become a better musician. – You’ve also got three new band members in your line-up. How long had you known them before they joined Uniklubi? – Tuomas, our keyboardist, I’ve known from my childhood years. He’s from the same area, Hämeenkyrö. Same with our new bassist. And I met our drummer Jani while working in the theatre on musical “Veriveljet” (“Blood brothers”). He used to drum for many big bands in Finland, and I knew his is one of the best drummers in Tampere. Of course, at first when we tried to jam together, it was a bit messy but that’s natural. Now the band is close to him and he takes part in writing new songs, too. – What’s your personal Top 3 songs on Uniklubi’s new album? – It changes a little with time. At the shows the coolest ones are Lavaa, Hei Hei Tähdenlento and Hauras Mieli. The thing is, this week I may like one song, and next week another. But I don’t really have favorite songs. Just at shows you notice which ones sound you enjoy singing. – Here is a hard one. If you had to choose just one band and there was no other music left in the world, what band or singer would you choose to keep? – Michael Jackson. He is so versatile. He has such a wide range of songs, a good rhythm and ideal song framing. In his music all the pieces are in all the right places. I actually remember myself as a kid doing MJ moves in front of the mirror. Who didn’t? He influenced so many people. His songs are amazing and no one can question that. – And among Finnish bands who are the most influential for you? – It’s such a hard question. I like so many Finnish rock bands… I generally like Finnish rock. If we talk about bands which had an impact on founding the band, these are Apulanta, HIM, Tehosekoitin, J. Karjalainen. There are great bands coming from Finland. – If you met a young yourself now, a 20-year-old Jussi Selo, what would you tell him? What advice would you give him? – What’s on Uniklubi’s agenda in the near future? – The plan is to release new songs early next year. It will be our 20th band anniversary and the 15th anniversary of our debut album. – Exactly! How will you be celebrating it? – With new music and shows. We’re writing new songs at the moment. When the time is right and the songs are well-rounded, we’ll go to the studio. During all the recording sessions for Uniklubi albums quite a lot of tracks were left out, like b-sides and concert-only songs that we could release. – Sounds good. Thank you, Jussi! Have a great show tonight!